Is CH3CH3 an acid or base or salt ? 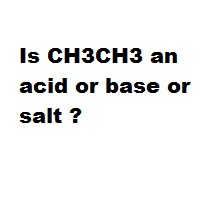 Home › Chemistry › Is CH3CH3 an acid or base or salt ? Question : Is CH3CH3 an acid or base or salt ? What is an acid, base, salt ?